This Mini Spinach and Cheese Recipe is perfect for your next party, great in the kids lunch boxes and it also makes a great snack! I decided to make this Mini Spinach and Cheese Quiche recipe a few weeks ago when I had some friends over to watch the Royal Wedding. They were a big hit (as were the Mojitos!) and we had eaten them all by the end of the night. They took no time at all to put together earlier that afternoon (well apart from having to keep my little helpers away!) however you can also make them in advance and then store in the freezer until needed. I know there are people out there who were over all of the talk and coverage of the Royal Wedding however for my friends and I, it was the perfect excuse to catch up and have a girls night in. To mark the special occasion, I pulled out our ‘good’ glasses and plates etc (which are normally hidden away from little hands!) and I also used this gorgeous platter from the Royal Botanic Gardens of Victoria Collection by Maxwell Williams. This recipe is based on my Mini Ham and Cheese Quiche recipe however I used puff pastry instead (only as that was all I had!) and I baked these Spinach and Cheese Quiches in a bigger muffin tin this time too. When it comes to the filling, you can use whatever cheeses you like. I went with Feta, Tasty and Parmesan Cheese and I think that it’s a combination that’s pretty hard to beat. 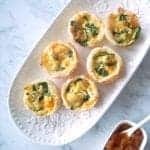 This Mini Spinach and Cheese Quiche recipe is perfect for parties, as a snack and also for the kids lunch boxes. These quiches contain tasty, parmesan and feta cheese and they are also freezer friendly. Remove the pastry from the freezer and allow it to thaw slightly. In a large jug, whisk together the milk and the eggs, onion flakes and add a sprinkle of salt and pepper. Lightly grease 2 x muffins tins, and using a 12cm round cookie cutter, cut circles of pastry and gently mould them into the muffin tins - you will make approximately 18 quiches. Equally divide the baby spinach leaves, feta, tasty and parmesan cheese between the pastry cases and gently pour over the egg and milk mixture. Place the two oven trays into your pre-heated oven and bake for 18 minutes, or until the filling is golden. Leave the mini quiches in the trays for 5 minutes to cool slightly and then transfer to a wire rack to cool completely. These Spinach and Cheese Quiches are freezer friendly. You can use different sized muffins tins to cook these quiches in, however the cooking time will vary. Place the parmesan and tasty cheese (which have both been cut into 3cm cubes) into your Thermomix bowl and mix for 7 seconds, speed 8 to grate. Add the milk, eggs, onion flakes and salt and pepper and mix for 10 seconds, speed 4 to combine. Scrape down the sides of the bowl and stir through the crumbed feta cheese. Lightly grease 2 x muffins tins, and using a 12cm round cookie cutter, cut circles of pastry and gently mould them into the muffin tins – you will make approximately 18 quiches. Equally divide the baby spinach leaves between the pastry cases and gently pour over the mixture. For more yummy recipes, check out my ‘Family Dinners Made Easy‘ Book, you can can also browse all of my print and ebooks here. Easy lunch recipe, can’t wait to try. Photography is great here! I’ve never made quiche and this looks so easy and delicious, I’m gonna give it a try! Thanks for sharing this recipe!